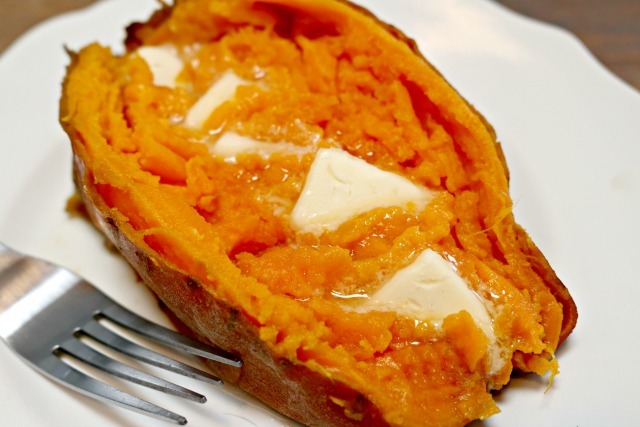 Sweet potatoes are not only delicious, but are also really good for you. They have quickly become a family favorite in our home, and it’s easy to cook Instant Pot sweet potatoes with very little effort, but tons of flavor! 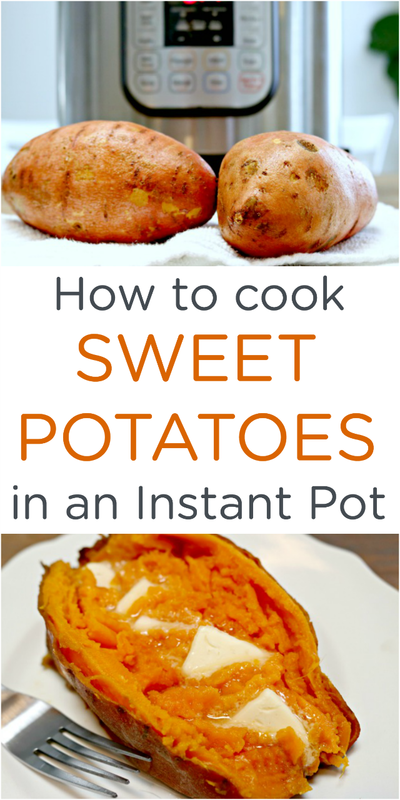 If you don’t have an Instant Pot, you can cook sweet potatoes in any pressure cooker. I have to be honest, I never really thought I liked sweet potatoes until a couple of months ago. I was and still am a huge fan of it’s cousin the russet potato, which is used mostly when making baked potatoes. 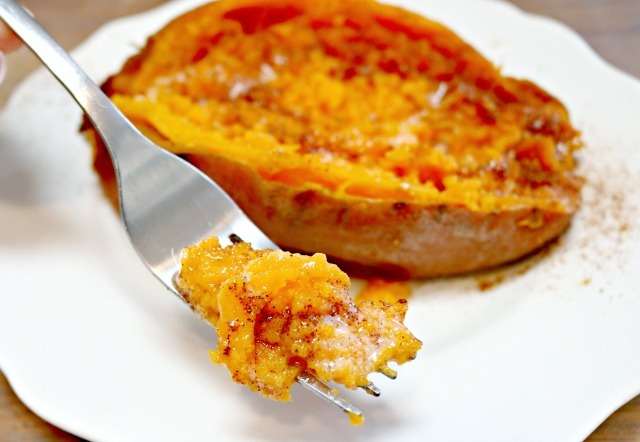 A couple of months ago, my husband and I decided it was time to make some changes to our diet, and decided to try sweet potatoes since they are full of Vitamin A, Vitamin C, and are a great source of potassium and dietary fiber. Wowzas, was I surprised! They are now one of my favorites, and the rest of the family now loves them too…win, win for this mom! I swear, they almost taste like dessert, but without all of the guilt. We’ve been cooking sweet potatoes in the Instant Pot, and it truly takes zero effort. 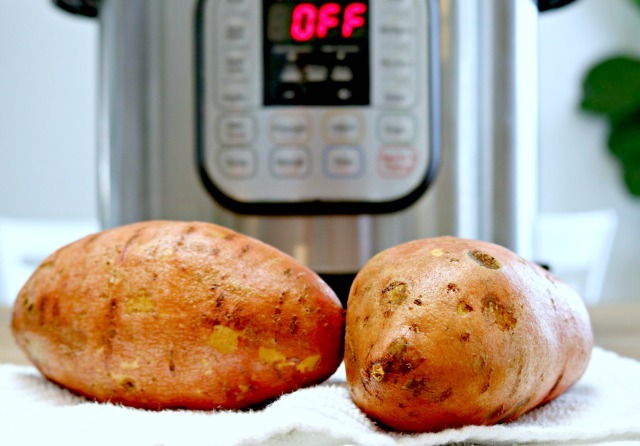 If you prefer russet potatoes, check out my post on How to Cook Baked Potatoes in an Instant Pot HERE. If you don’t own an Instant Pot and are interested in purchasing one, you can find the Instant Pot I have HERE. 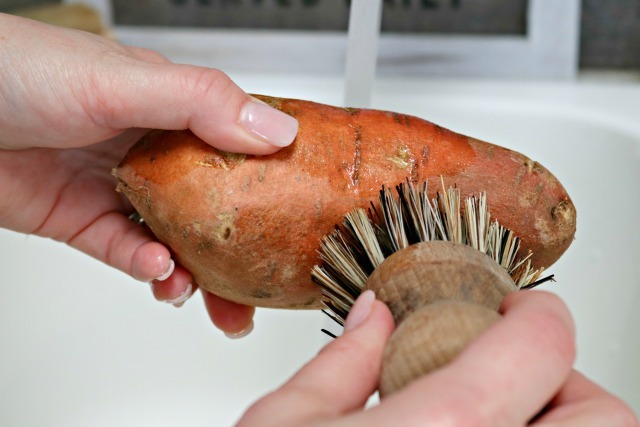 Start by scrubbing your sweet potatoes and removing any dirt or debris. Nobody wants to eat dirt, right? Don’t worry if some of the skin comes off of the potatoes…that is totally normal and won’t effect the way the potatoes cook. 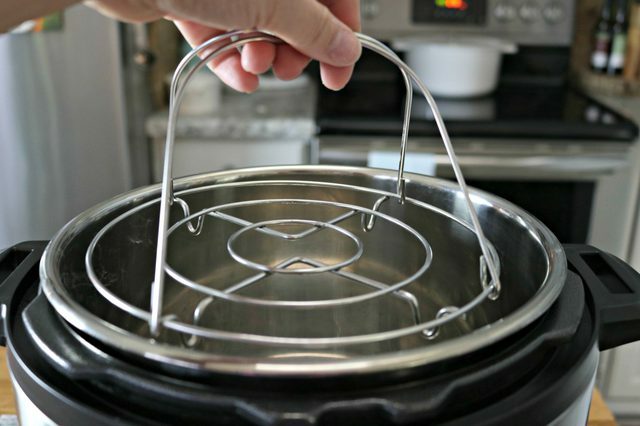 Next, drop the steamer basket into your Instant Pot or pressure cooker. If you don’t have a steam basket, you can use a vegetable steamer or purchase this steamer basket. 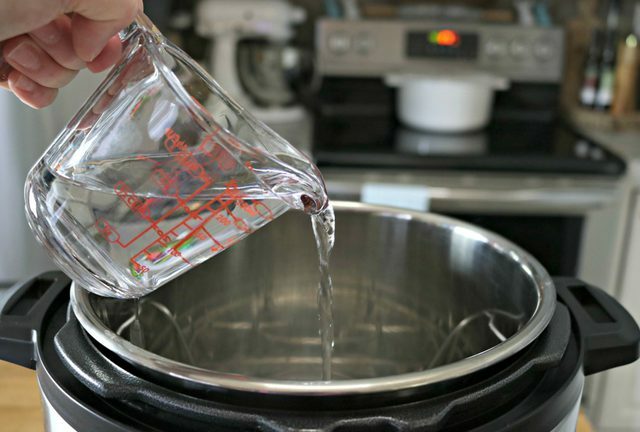 Then add one cup of water to your pressure cooker. This is super important for cooking the potatoes well. Funny story…I once forgot to add the water and let’s just say that steaming potatoes with no water isn’t a great idea, and thank goodness the new versions of pressure cookers have safety shut offs. 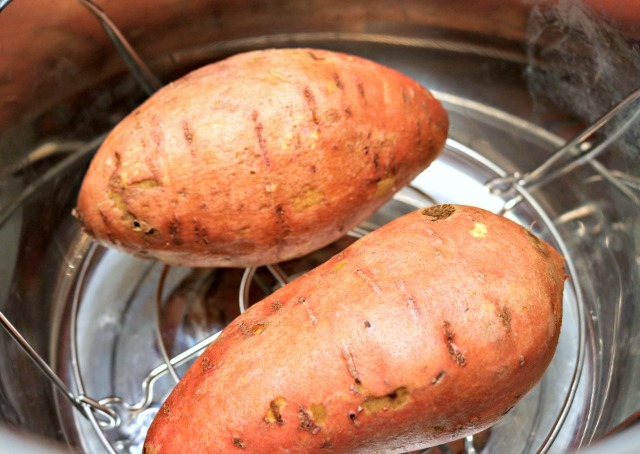 Place your sweet potatoes on the steamer basket. I cook anywhere from 2-6 sweet potatoes at a time. Close the lid and set the timer to Manual for 15 minutes. Then sit back and let the Instant Pot do the work for you! 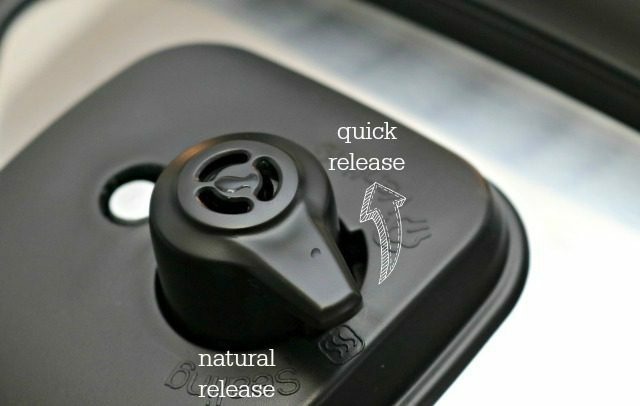 Once the timer goes off, you need to leave the steam release valve set to natural release for 25 minutes. This will allow the sweet potatoes to finish cooking properly. Once 25 minutes is up, move the valve to quick release, then remove the lid. 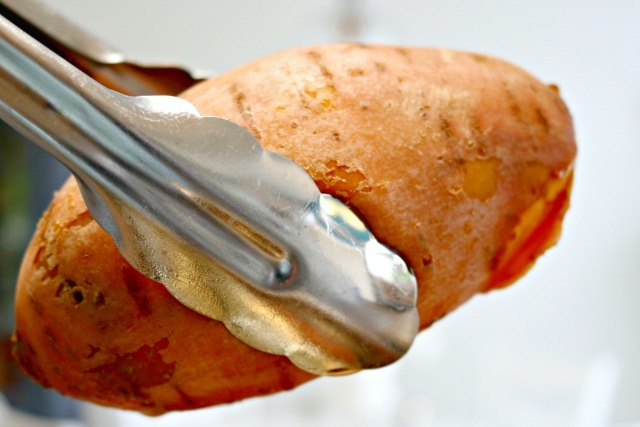 Use a pair of tongs to remove the sweet potatoes and serve immediately. If you want to cook them ahead of time, you can refrigerate them and reheat them in the microwave later. 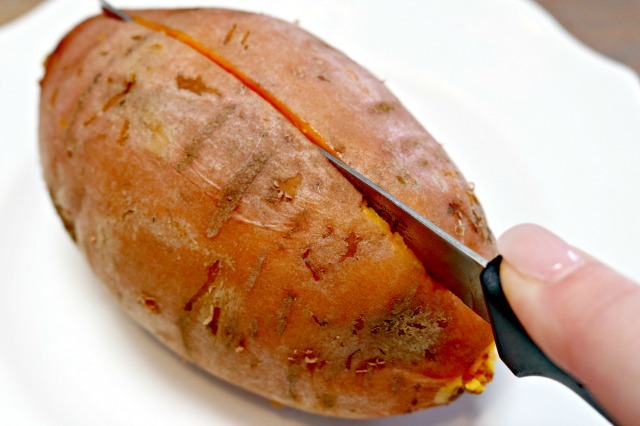 Slice the sweet potatoes open and gently mash the inside of the table using a fork. Add some butter and enjoy! If you like to be adventurous, you can add a dash of cinnamon…I promise, it will not disappoint! Serve these delicious sweet potatoes with just about anything you cook. We love to pair them with steaks, chicken and pork chops. 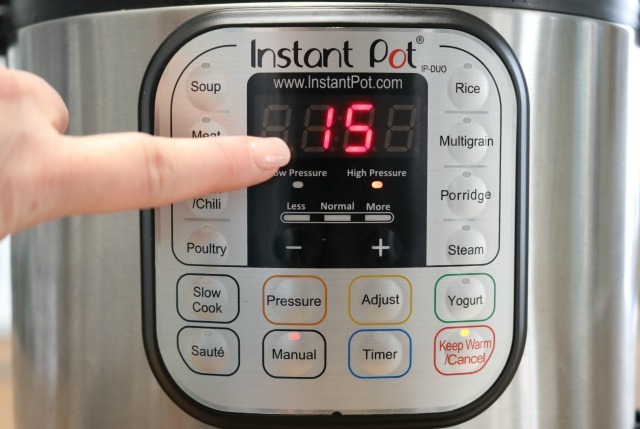 If you love cooking in your Instant Pot, check out the recipes and tips below! 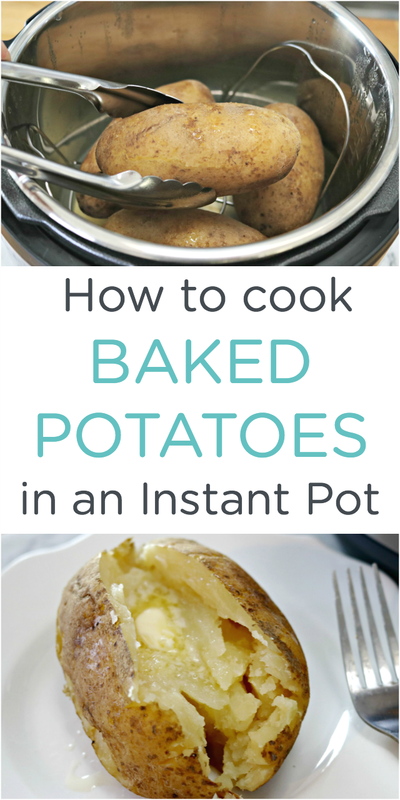 If you love baked potatoes, check out How to Cook Baked Potatoes in an Instant Pot HERE! 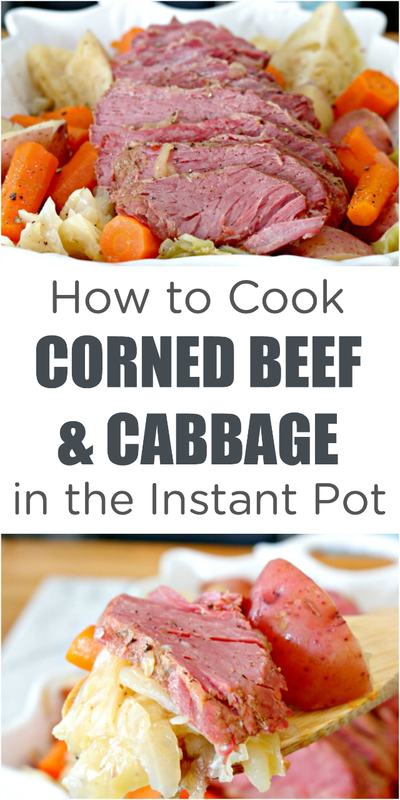 Knock the socks off of your family and friends with this crazy delicious Instant Pot Corned Beef and Cabbage Recipe! 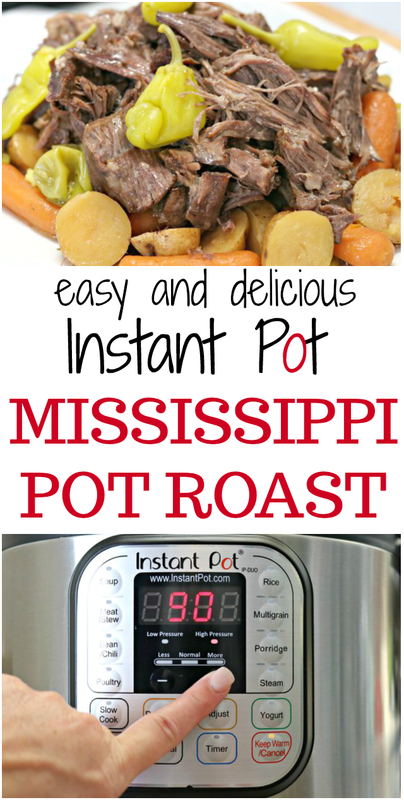 Please the entire family with this family favorite Instant Pot Mississippi Pot Roast! 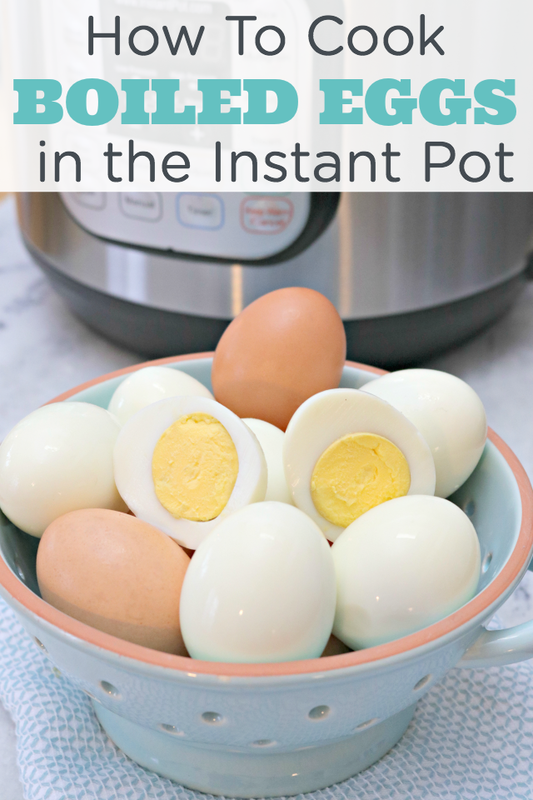 Learn How to Cook Boiled Eggs in the Instant Pot and save yourself a ton of time, especially during Easter egg dying time! roast a sweet potato, peep it, mash lightly with a fork, then drizzle hot bacon drippings on it. It’s awesome. Is there any way to make sweet potatoes and regular potatoes together? For sure…the only thing is that they may taste a little similar if cooked together because the flavors will definitely intertwine with each other. Hope this helps! Could you wrap one of them in aluminum foil? I’m sure you could, but you really don’t need to. If I don’t have a steamer basket, can I set the potatoes on the trivet? I think they should be fine…they may be a bit more mushy though if they aren’t lifted out of the water a bit.